How was your week? Mine was kinda disappointing, as I had another job interview, but I didn’t get the job. 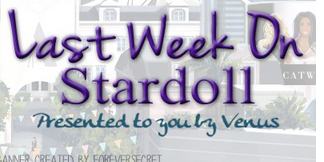 Well, more time for Stardoll, right? Anyway, I hope at least you had a nice week, and in case you missed something, here goes my recap. On Monday, as expected, we got a new Bod Mod collection. This time, of course, it was Halloween inspired. We got so many costumes for our dolls, from spiders, moths, demons.. there are just too many costumes. And I love that. I love that Stardoll took time to design all those fantastic costumes, I am only disappointed there isn’t a vampire costume. Witch costume, in my opinion, is the best, and I loved Demon costume as well. I like that we got several nice wigs, as I like to buy them so I can use them later on my mannequins. Anyway, great collection, I may only wish they gave us sliders for in-ordinary skin tones, instead of having to buy them. On Wednesday, another Halloween themed release – interior this time, and I am talking about Film Theory store. The store seems to be inspired by Nightmare before Christmas – a popular Halloween themed cartoon. We have some dolls too, some characters from the movie, and they seem pretty interesting. I am not fan of decorating my suite for Halloween, as my country doesn’t celebrate it, but I love seeing themed rooms and outfits. I may dress my doll, but that’s it. MSW15 is over, so, as expected, we got a 30% off leaving sale in MSW15 store – surprisingly, only on 1 floor. I love that we got a sale, and an announcement that the store is leaving. I hate that I already bought some stuff I wanted, but I still ended up buying some more items – it is a sale, after all. This year Stardoll released some really great items in store, so I was glad I had a chance to buy many items I liked. Bye bye MSW, and see you next year! And on Friday, Stardoll released new SubCouture collection. The collection is, as usual, pretty different from other 'ordinary' collections. It stayed for 2 days, as usual. There were many mesh fabric pieces, some nice coats, dresses, and great accessories. There weren't many color choices, with black being the most dominant color. I am glad I bought most of the stuff I wanted. (Well, except for those mesh heels, as they were superstar only). Anyway, I am glad it wasn't regular LE collection, it is just too soon. And that's all, folks. I hope you enjoyed last week, I hope you loved my recap as well, if you did, vote, comment, and I'll see you guys next week.